New competitor. Interesting ......looks like they simply took their recycler platform and engineered a motor/battery compartment to fit where the gas motor used to be. 56 volts, brushless motor with push and self propelled models...6ah and 7.5ah batteries. Big c.f.m. blower with low air speed . Nice to see others enter the fray. Listed on Home Depot website. Hmmm... the battery and charger look strangely familiar. I wonder why? I do like that the battery has a handle. Looks like Snapper is in the fray too. 45 minute run time on a 2ah battery. Pretty good claim. Thanks for posting this. A 22" steel deck, side discharge (great for mowing thick layers of leaves on my property then mulching them), mows almost a 1/2 acre, local Toro warranty repair and support, and uses the Toro personal pace self propelled (which I have now and is amazing). I'm finally ditching my old Toro gas mower and going battery powered! I still love my Ego leaf blower and chainsaw but competition is always a good thing and this is the battery powered mower I've been wanting for years. I would love to see an A-B comparison between the 2. Like I said, I would think a 2x5.0 or 2x7.5 Ego would smoke the Toro. I've been kinda wondering when a company that already has a pretty decent gas machine would just put an electric motor on it. So kudos to Toro for doing the obvious. Very good move to say hey"same personal pace you love! " Seems like another battery mower shootout on YouTube would be great. My bet would be on Ego....maybe 1 and 2 finish with dual first then steel deck next.....but Toro may have a shot. 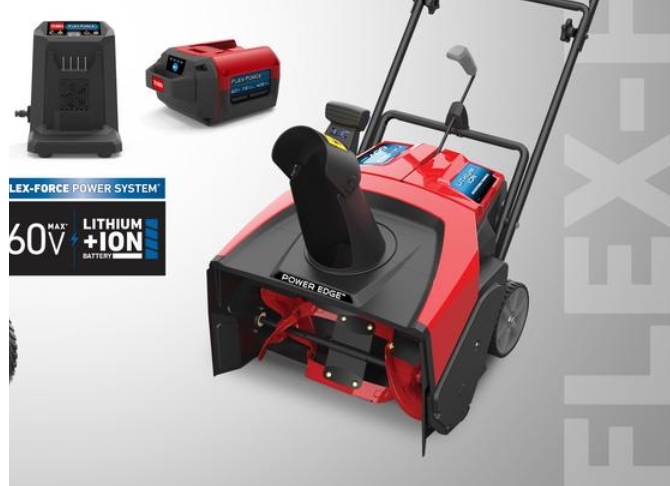 If Toro puts an electric motor/battery on their Snowmaster 724/824QXE snowblowers I'm in. The competition is good and the more comfortable people become with battery powered mowers...the more people there will be for EGO win customers over. Anybody seen a price list for how much Toro is going to to charge for replacement batteries? Haven't found any battery pricing yet. I am interested in their sbowblower though. It's not self propelled but I'm curious if the all metal auger works better. They also claim "New design pulls itself through the snow"
I came across this review of the new Toro 60v Flex Force line. The snowblower looks interesting too. It claims to have a "patented pending steel auger design" so apparently no rubber auger paddles, clears down to the pavement, and is designed to pull itself through the snow. "Will clear 33% more area with a single charge than the closest competitor. (Competitor’s machine also needs two batteries for operation!)" Wonder if they're talking about Snow Joe or EGO? If they’re talking about Ego they’re being deceptive because the Ego snowblower doesn’t require two batteries to run. And EGO is deceptive with 56v. All companies have some sort of deceptive or leading marketing. Oh well. Here's a closer look at the snowblower with the steel auger. Looks like the auger will act more like a two stage snowblower and clear down to the pavement with a scraper bar? I'm not sure Erik but you can't beat Home Depot's 90 day return policy to try these new gadgets out to see if they do what they claim to do. I'm interested in the all metal auger and what they have for scraper bar. EGO is pretty popular, but Toro has been around forever and if they've got a quality battery and product it will be interesting to see how they do with this line.